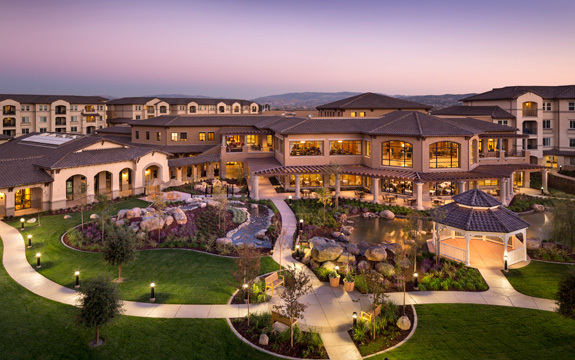 A growing trend in housing for senior citizens is the CCRC - Continuing Care Retirement Community. These are communities where people initially move in while they are still in good health and enjoy independent living in their own private residence. Later, if the residents eventually need higher levels of care such as assisted living, skilled nursing or memory care, they can get whatever help they need while staying in the same community. There are a wide variety of CCRCs with different types of amenities. The costs vary accordingly. CCRCs are located throughout the United States. They have become a popular alternative for people who do not have long-term care insurance and want to make sure they will receive care for the rest of their lives, no matter what happens with their health. However, not everyone who moves into a CCRC is someone who does not have long-term care insurance. Some types of CCRCs do take this insurance. Others will accept Medicaid payments to cover at least part of the cost of nursing home care. Most CCRCs require a buy-in or entrance fee that, in many cases, will be partially refunded to your estate when you leave or die. On the other hand, there are some that are entirely rental. All of them have a monthly fee, including the ones that require you to buy it at the beginning. In some cases, the fee is guaranteed to remain about the same as long as your live there. In other cases, you pay different amounts based on the services your receive. It is wise to thoroughly investigate all the choices in your area so you know the options that are available before deciding which one is right for you. There is a wide range in costs for a CCRC. If you choose one with a buy-in, it can cost $300,000 or more at the time you move in. If you rent your housing unit rather than buying it, you may still have an entrance fee of $20,000 or more ... but not always. In either case, you will also have a monthly fee. Some facilities that cater to middle-class and low-income senior citizens may allow you to apply for Medicaid and apply it to your expenses. There are also CCRCs for people who have long-term care insurance. If the CCRC you choose is a life-care community, you will typically pay a large up-front fee plus a monthly fee that will remain about the same no matter how much care you need in the future. This is particularly popular with people who do not have long-term care insurance or family members who could care for them, and want the security of knowing that they will be cared for no matter what happens to them in the future. If you choose this option, financial advisers recommend that you have a professional scrutinize the financial viability of a community before you trust it with your life's savings and care. Below is a list of popular CCRCs in Orange County, California. In nearly every major populated area in the United States, you will find similar types of communities. In some areas of the country, the costs may be less ... or more. Regent's Point - Irvine, California - Entrance fee ranges from $47,500 (for UCI alumni and faculty) to $467,500, plus a monthly fee of $2,352 to $4,936 a month. In addition, there is a tiered cost plan. The more services you need, the more you pay. Capriana - Brae, CA - $300,000 to $500,000+ entrance fee - minimum monthly fee of $4,195 plus additional charges for extra services. They will help you sell your current home to help make it possible for you move in. Covington - Aliso Viejo, CA - No specific buy-in price was publicly available. However, like most of the others in Orange County, there is an entrance fee and reviewers indicated it is one of the more expensive options in Orange County. However, 90% of your entrance fee is returned to you or your estate when you leave the community, once the unit where you lived is reoccupied. The Covington does not accept Medicaid, Veteran's benefits or long-term care insurance. Basic daily cost for a private room in their care center is $309 a day. Fountains at Sea Bluffs - Dana Point, CA - No pricing information listed. While not confirmed, one reviewer said that she was paying nearly $9000 a month for her father to live there in the memory care facility. Town and Country Manor - Santa Ana, CA - Independent living ranges from $2,750 to $4,090 a month, plus $1,250 a month for a second person in your apartment. There is a $1,000 application fee. Assisted living ranges from about $4,000 to $4,550 a month, plus $1,250 for a second person. Skilled nursing is based on the level of care needed. There does not appear to be memory care at this facility. Residents do not have a buy-in. This is a rental CCRC. Walnut Village - Anaheim, CA - According to reviews, this CCRC has entrance fees that range from $209,000 to $700,000+ and 90% is refundable. There is also a monthly fee that can range from $2800 to $6200. There are cottages as well as apartments. Morningside - Fullerton, CA - The reviews indicated there was a large entrance fee, but it was not published on their website. It is operated by the same company as Reata Glen, described in detail below, so fees and the way it is operated will probably be similar. Brookdale - San Juan Capistrano, CA - There is an entry fee, plus a tiered level of monthly costs, based on the care you require. You only pay for the services you need. There are a variety of plans available. For example, you have the option of paying a lower entry fee if you have long-term care insurance. In addition, you can choose from a variety of refund percentages and this can alter the size of your initial buy-in costs. A new CCRC is under construction in San Juan Capistrano, CA. They have 19 designs in both apartments and villas. Sizes range from a one-bedroom with 646 square feet to three bedrooms with 2,827 square feet. Depending on the size of the home you choose, the buy-in entrance fee can range from $400,000 to $2,499,000. A typical two bedroom, two bath 1,268 square foot Garden Terrace with covered parking can have a buy-in of $949,000 to $993,000. For those who do not have covered parking with their apartment, there is an optional additional entrance fee of $10,000 for a carport and $25,000 for a garage. There is also a monthly fee which should remain stable during the remainder of your life. Like most other CCRC's, there will be a variety of amenities. When complete, this community will have tennis courts, a wood shop, gardens, a putting green, a swimming pool, a fitness center, and a performing arts center. If you are interested in learning more about where to retire in the United States or overseas, common health concerns, financial planning and more, use the tabs or pull down menu at the top of the page to find links to hundreds of additional articles. I didn't realize there were so many CCRCs locally. I have attended a seminar at Reata Glen. They already have a long waiting list. It's going to be a beautiful facility with wonderful services. As with most of these communities, finances will be the major consideration for most people considering this choice.